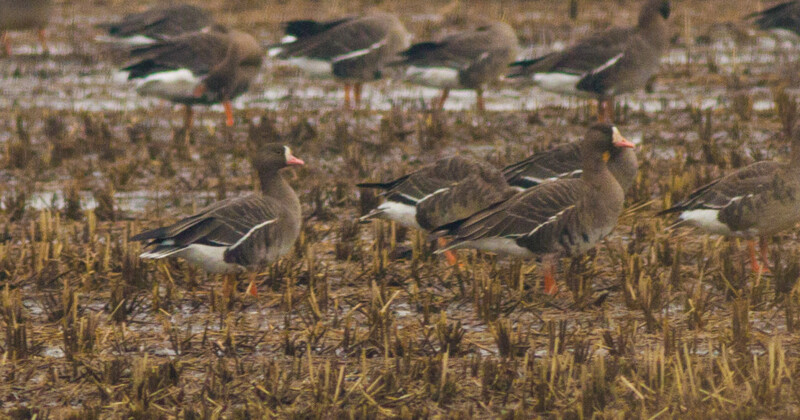 On November 28-29, three good friends met up for a grueling yet amazing weekend of birding at a huge site still full of birding potential, in spite of signs of trouble everywhere (concrete…construction…). We ended up logging 66 species for the weekend, with several surprises among them. Saturday was dim and overcast, with chilly temperatures hovering around freezing, and snow from earlier in the week still covering most of the landscape. On a weekend with many highlights, some bird encounters nevertheless stood out as noteworthy. 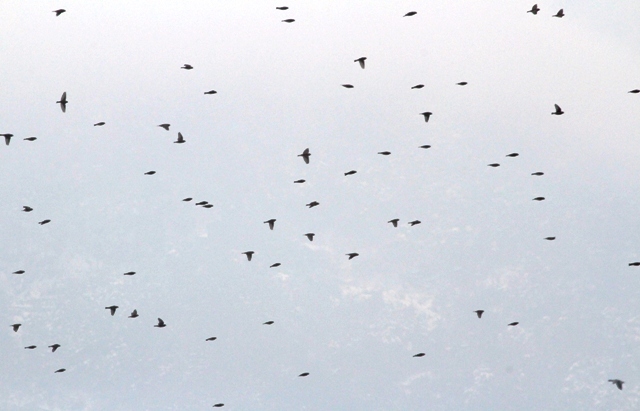 We soon caught up with one of our target species, as 300-400 Lapland Longspurs shimmered restlessly across the landscape in undulating flocks, before coming to land in the fields. 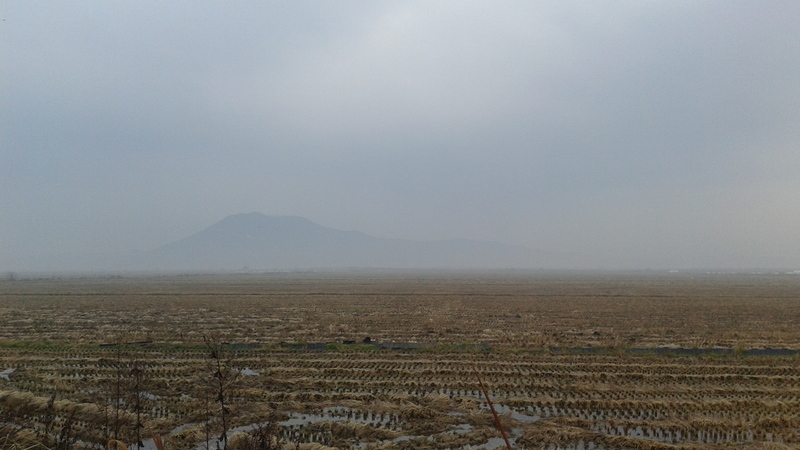 They vanished amidst the stubble and skulked among the furrows like mice upon landing, never giving very close looks. 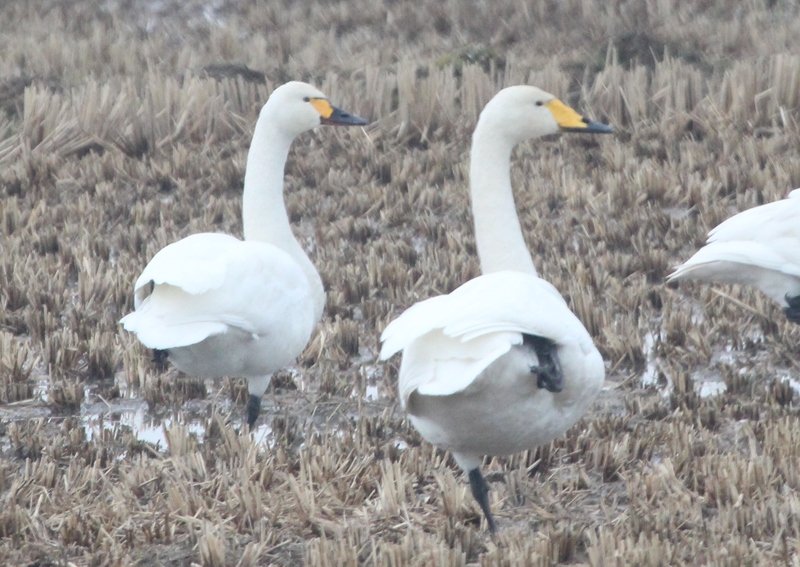 Soon after that encounter, we spotted two Tundra Swans mixed up with at least a hundred Whooper Swans, and we spent a long time comparing the two similar species. Several hours later, in a memorable and serendipitous birding moment, we pulled the car over next to a man-made pond to have a brief snack, as the rain started up again. While we were eating, all three of us casually looked to the right at the same time and saw a motionless shorebird on a spit of mud several metres from the car. 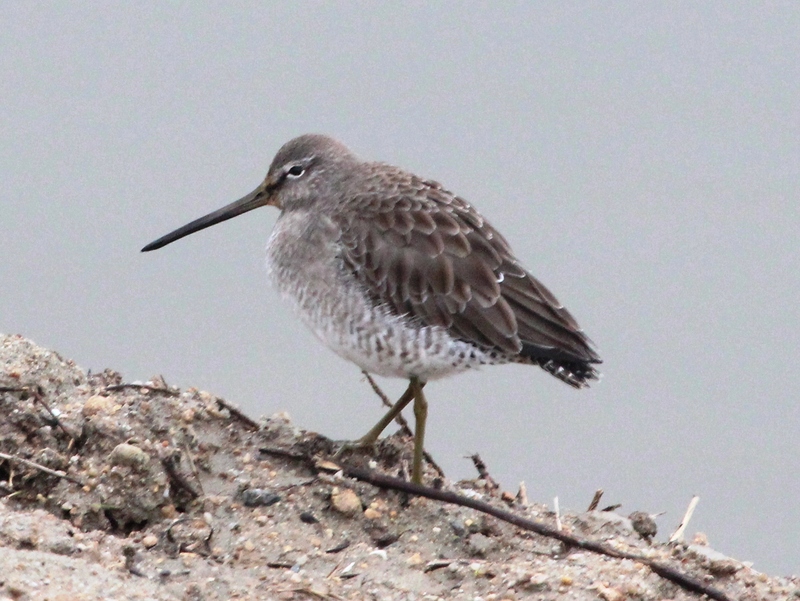 Looking like a ‘Grey-tailed Tattler with issues’ at first glance, we stared at the bird in silent confusion for several seconds before starting to put the pieces of the puzzle together. 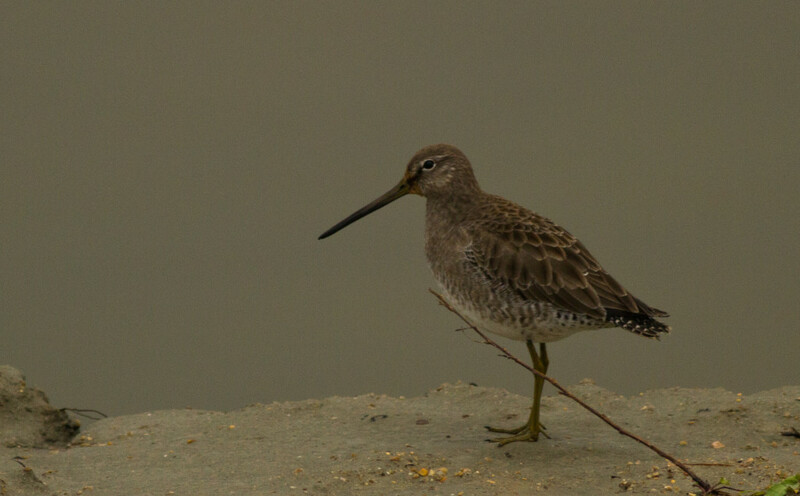 It had to be…but it couldn’t be…it WAS…a Long-billed Dowitcher! A most welcome and unexpected encounter with this less than annual vagrant. Other notable target birds we spent time with included a Chinese Grey Shrike, a Lesser White-fronted Goose, and three Eurasian Bitterns. Geese were everywhere this weekend, with at least 5,000 Bean and Greater White-fronted Goose seen in and over the fields at all times. 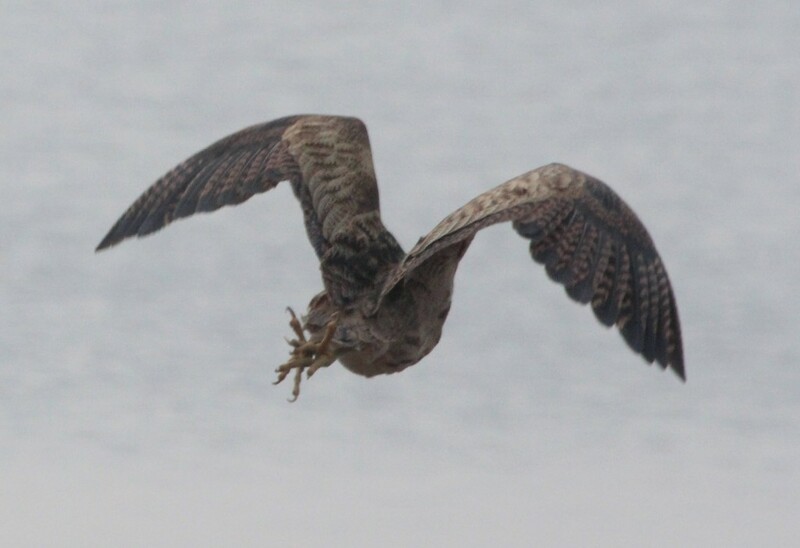 The most abundant raptor was Eastern Buzzard, with at least 19 seen over the weekend – several reddish individuals among them. 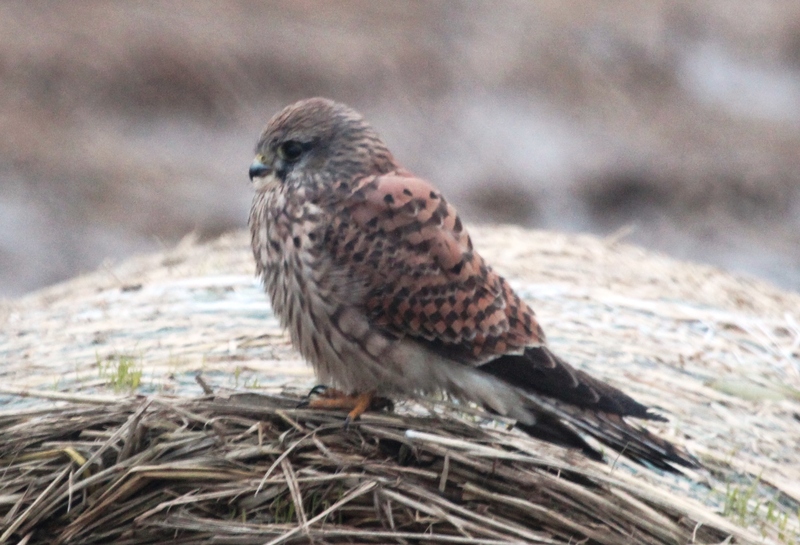 A handful of Common Kestrels and Northern Goshawks were seen patrolling the fields, as well as three Hen Harriers. Multiple flocks of 30-60 Grey-capped Greenfinch and Brambling were seen near villages and lightly wooded areas, and lone Dusky and Naumann’s Thrushes in the same tree was an interesting sight. Yellow-throated, Rustic, and Black-faced Buntings were also present in most scrubby areas. On the 29th, the skies were still overcast, and the temperatures were warmer (with most of the snow melting) with intermittent rain. The day was also a much quieter one, bird-wise. 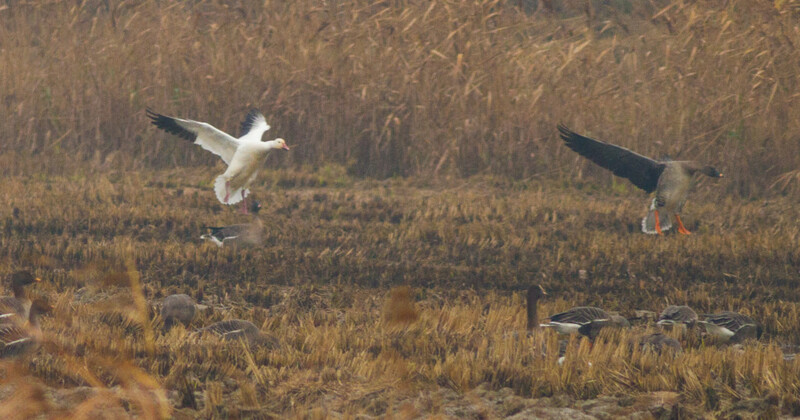 In the late morning, a Snow Goose was spotted with several hundred Bean and Greater White-fronted Geese near Seosan Birdland. None of the busloads of visitors to this tourist trap took note of the spectacle of wild geese within a stone’s throw of the parking lot. The visitors we saw were more interested in frightening a caged one-winged Cinereous Vulture and quivering Northern Goshawk by dancing (to the music being pumped out of speakers) and shouting in front of the cages, then laughing when the birds got agitated. These birds, along with a captive Eurasian Eagle Owl and Peregrine Falcon among others, were a pitiful and depressing sight indeed. For those interested in ‘birding’, several oversized fibreglass Hooded Cranes had been planted in a field for guests to look at through scopes. An enclosure next to Birdland held a large number of Mandarin Ducks in cramped quarters, for some reason. This situation definitely merits further investigation. All in all, this place felt like a poorly thought out and grim attempt to soak up tourist money.